New York.- Prominent Greek Americans from New York, New Jersey, Illinois and Washington DC participated in the first fundraising for Hillary 2016 in the tri-state area. Wealthy businessman Dennis Mehiel, a Democratic candidate for lieutenant governor and a close supporter of every Hillary Clinton campaign, was coordinating the $2,700 per plate event. Although there was no announcement yet of a “Greek Americans for Hillary Clinton Committee”, the chairman of her national presidential campaign is John Podesta, former Chief of Staff to president Bill Clinton and senior advisor to Barack Obama. 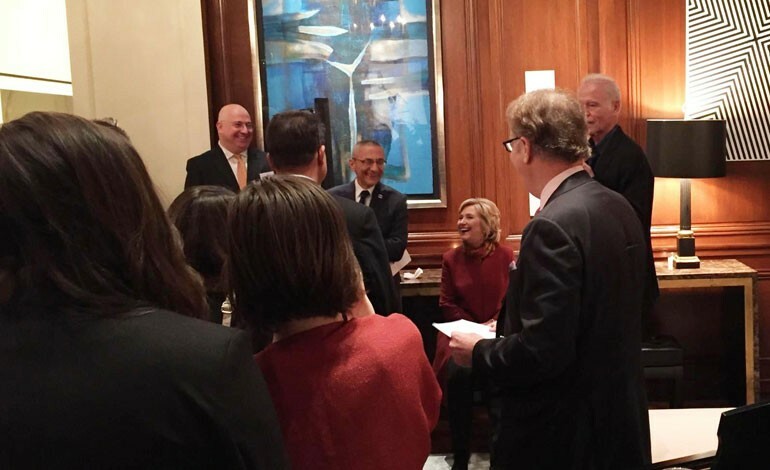 John Podesta, a Greek American with roots in Arcadia, Peloponnese, has spoken at the fundraising. Andy Manatos, president of the Coordinated Effort of Hellenes, a former Assistant Secretary of Commerce in the administration of President Jimmy Carter and a personal friend to the Clintons, introduced Hillary Clinton to the gathering. Greek News was told that Andy Manatos praised the role President Bill Clinton played in opening the way to Cyprus’ entrance to the EU. For that, he said, Greek American community is so indebted to him, even if Hillary doesn’t do anything for Greece and Cyprus in the future. Hillary Clinton in her remarks praised the Greek American community and touched on some of their concerns. 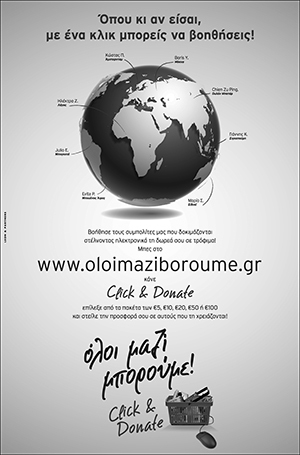 She praised Greece for all it does to tackle the refugee crisis, despite the huge financial turmoil the country is in. Hillary Clinton expressed concern on the situation in Turkey and the policies followed by Tagip Erdogan. She said that he has changed a lot since she has met him for the first time as Istanbul Mayor at a Conference for Religious Freedom. The Democratic frontrunner also touched on Cyprus, pointing out the importance of its acceptance by the EU. She told the audience that Cyprus will remain and important challenge and one that she will take seriously. “It’s fair to say that centering Cyprus within the EU is creating support that will be difficult to overlook. It is something that has kept the status quo. Because the status quo is not adequate and we have to try to as best we can to reach a final settlement that will mean the end of Turkish troops and that the communities will have once again to live in their respective areas, but actually work together where is possible. Something they actually did for many – many years before. So Cyprus will remain and important challenge and one that I will take seriously”, Hillary Clinton added. Save your money; she will be indicted for multiple violations of usc section 18 for her misuse of classified emails and trading favors for donations to the Clinton foundation during her time at state. Her lack of morality is sufficiently compelling to assure that she doesn’t make it past the convention. She has compromised the security of her office and nation. Truly, what is the appeal of this pathetic, sycophant of the failed Obama administration. This country cannot afford another four years of misguided leadership.